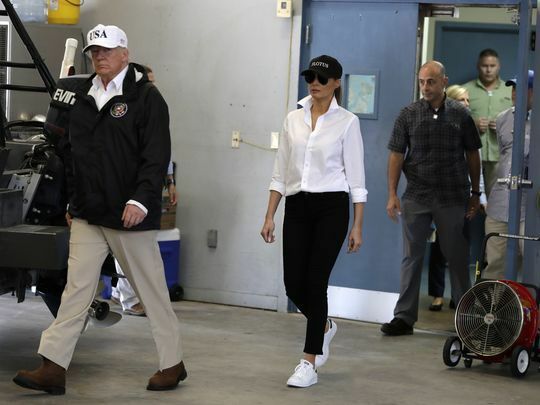 FLOTUS Wears Spike Heels to View Texas Damage … Left-wing Media in a Tither! Spike heels … are you kidding? Of course you can see from the photograph, she must have somehow found time to change from Spike Heels into sneakers on the flight down from Andrews AFB. It is obviously hard for the left-wing media to believe that the First Lady would be capable of such a daunting task! I mean, change her shoes? What was she thinking. Left-wing pundits are obsessed with the state of her shoes while the rest of America worries about the rescue efforts and what will be needed to rebuild! It is just another piece of evidence as to how political the media has become and how it has, in fact, become an enemy of the American People. As I have posted in the past, a Free Press is certainly a vital part of a free and democratic society. The lest-wing media simply continues to prove time and time again that it is not a Free Press. It is the propaganda wing of the Democratic Left-wingers and Progressives. Mean While … In the Real World! Texas Gov. Greg Abbott had high praise for President Donald Trump and the federal government for its response to Hurricane Harvey, describing it as “A-plus.” This effort is only just beginning. It will be a long haul because this storm and its rain will continue to weak havoc for several days. I’ve got to tell you, I give FEMA a grade of A+, all the way from the president down,” Abbott said. “I’ve spoken to the president several times, to his Cabinet members, such as secretary of homeland security, such as the administrator of FEMA, such as Tom Price, the secretary of health and human services. Of course, you won’t hear any of that on CNN, MSNBC, CBS, NBC, ABS, The Washington Post, The NY Times, or any of the left-wing’s propaganda tool … the one that, at one time, was the American Free Press!